I'm about to move and a really promising location in a new city and it's surrounded by a large forest and bird sanctuary. That's great to me, but to my cat I suspect it will mean the beginning of his reign as a genocidal maniac against the local birds. 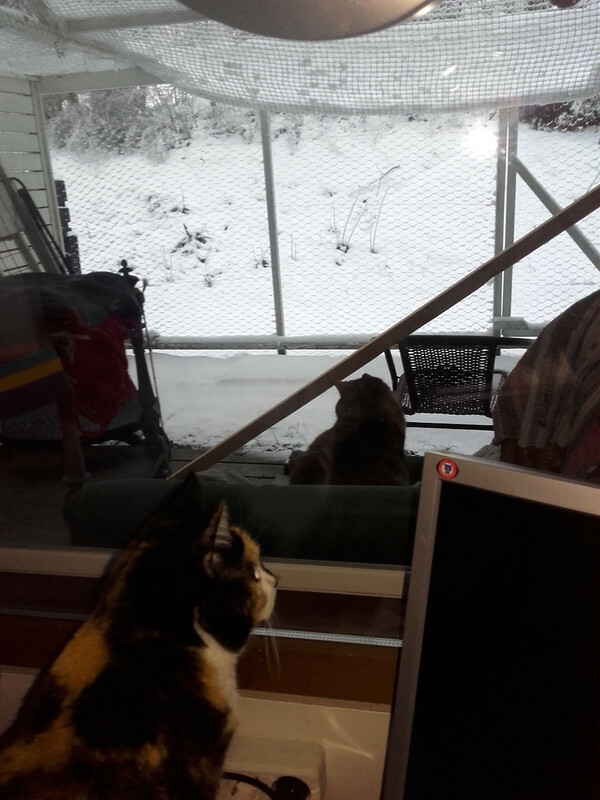 On the one hand, regardless of where I move it seems this cat will be a bane on wildlife. On the other hand, given that this is a bird sanctuary, it feels particularly wrong to move there with this cat and just let it do its thing. TL;DR skipping details on bottom: 3 year old Cat is very active and violent, otherwise a good cat to us humans. Never able to keep a collar or even harnesses on him. We rescued him off the streets and he's only semi-domesticated, keeping him indoors seems like barely an option. With all that in mind, what can we do regarding this move and this cat to minimize disturbance to the bird sanctuary? Is it a no go, either we don't move there or we give away the cat? Is there any training or equipment we can use to minimize him disturbing the bird sanctuary? We could try to force him to be an indoor cat but I don't think he'll handle that well, it seems very against his nature. We could just let him do his thing, but we care a lot about the forest and know that cats can wreak havoc on its wildlife. Some background on the cat: my partner and I met this cat as it meowed from under a porch as we were discussing getting a cat, an idea that we'd been considering for a few weeks. It was mid-February in a northern climate and very cold and snowy. We meowed at the cat for a bit and pretty fast he came and met us. We inspected the cat, picking him up and checking his fur and body out. He was pretty clean, no fleas we could see, seemed to be in good health. His paws and teeth indicated that this cat had been leaving outdoors for at least a few months, and he was mature but <1 year old from what the vet said. We've had this cat for a few years now. He was a real terror at first in terms of violence; he was mostly playful and not that aggressive but he was strong and intense in playing, would attack our feet and attack us at night if he had the chance. Over time and being neutered he's gotten better in some ways but is still an aggressive, big and tough cat. He used to go outside and disappear for days at a time when we first got him, but he'd keep coming back, even after we moved with him to new rentals locally a few times. Now he'll only go out for a few hours or a day at most, but he still begs to go out, tries to sneak out, and will even start attacking us more often if we refuse to let him out for a few days. I've seen my cat with 2 sparrows he's brought home dead in the past, he does 'cat chattering' when watching birds out the window, and I saw him try to climb into a bush to catch a bird once which he probably would've succeeded had I not chased him away. He's also killed and maimed many other animals not just birds. Whatever your general opinions on free-roaming cats may be, allowing your cat to hunt in a bird sanctuary definitely sounds like a highly irresponsible thing to do. If you'd rather not lock your cat entirely indoors, one option to consider would be to build a secure outdoor enclosure for your cat. Unlike Allison C, I wouldn't rely on just a fence, no matter how "cat-proofed", because cats are really, really good at finding ways over, under or through fences. What does work though, in my experience, is simply surrounding a suitable space on all sides with a durable net or wire mesh, and making sure there are no holes large enough for a cat to get through. The details will vary depending on what your new house or apartment is like, but it could be as simple as surrounding a balcony / terrace / patio / veranda or any similar "semi-outdoor" area with cat-proof net or mesh. The new structure extends a few meters into the back yard, so that there's room for a small garden inside, including some vines to climb and partly cover the wire fence (not yet visible in these photos). It consists of just a few wooden posts and beams that attach to the existing partition walls between the neighboring patios and support a chicken wire fence between them, with the old nylon net now serving as a roof over it (because cats can climb, you know) and the chicken wire extending some distance underground (because they can dig too — not that either of these two have ever tried). We even built a simple lockable gate (half visible on the right side of the second photo) into the fence so that we can still get to the outside (not that there's much there, except some trees and neighbors' back yards) without having to walk around the whole building. The important thing to remember (for your peace of mind, and the safety of any birds living nearby) is that cats can squeeze their head through surprisingly small holes if they're sufficiently motivated, e.g. by tasty birds waiting just outside — and if the head gets through, the rest of the cat will most likely follow. (For evidence, see e.g. any of these YouTube videos.) But there are limits, and something like a 1 inch / 2.5 cm mesh size is definitely too small for any adult cat to possibly get through. Meanwhile, it's still large enough that any small birds or rodents that may unwisely enter the enclosure can also easily get out. Ps. I wrote most of this answer before noticing the How to let an indoor cat have some outdoors time safely? 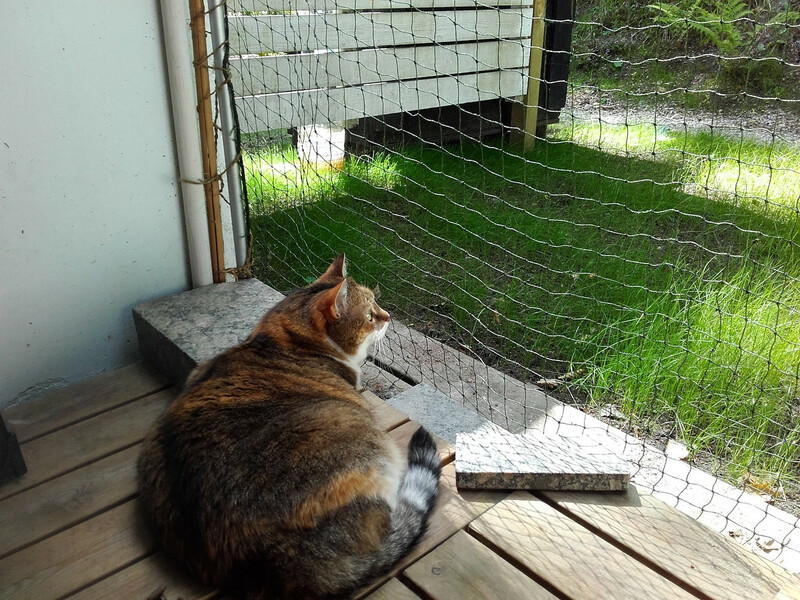 thread, which also has some pictures of outdoor cat enclosures. I figured I'd post this anyway, because it's still a valid answer and shows a somewhat different style of enclosure. The best situation for any domestic cat is to live indoors; it would have been an easier transition when he was younger, but it can still be done, if you're willing to endure a period of "misery" for both yourselves and for him as you retrain him. A new location may very well aid in this reconditioning. High fences -- too high to jump over. Low fences -- cats can squeeze into some small spaces, so you'll need to ensure there is no ground clearance; ideally, you should bury a section of the fencing to guarantee the cat can't slip underneath. Dense fences -- Again, cats can squeeze into small spaces, so you'll need to eliminate any potential spaces in the fence where it could slip loose. "Cat proofing" at the top of the fence. This is done by stringing the top with a core surrounded by a free-spinning piece of wide PVC pipe. The pipe should overhand both sides of the fence (you can also add a slanted section of fencing below it, that likewise slants toward your yard). If the fence is too wide for a reasonable sized length of pipe, use two, one angled toward each side of the fence. The goal is to make it impossible for the cat to get a grip anywhere; the pipe will spin if it tries to grip it, and if positioned right, the roller will also prevent the cat from reaching around or under to grab the fence behind it. Keeping the roller toward the outside will prevent nosy climbing wildlife from entering your yard and becoming trapped, which could be a hazard to either them or to your cat, depending on the wildlife. Tree trimming -- Even with a high, low, dense, cat-proofed fence, the cat will still be able to escape if you have a tree with branches reaching over it that he can use to evade all these defenses. Get branches trimmed, or consider adding some cat-proofing to prevent climbing the trunks. You'll want to spend some time outside "thinking like a cat" as well. Imagine yourself as the cat that wants to get on the other side of your fence, and do your best to hunt down any places you might have overlooked where he could sneak out. As a bonus, a well cat-proofed fence will also help keep a good amount of wildlife out, too, so while he may have less to hunt, you'll also find fewer gifts from him. An additional note: A harness is not meant for long-term wear on a cat, and the vast majority of cats hate wearing them. Most cats also don't care much for collars, though can be accustomed to them with time. Cats aren't small dogs, and don't naturally walk on leashes; they're solitary ambush predators, not pack hunters who follow the lead of other members of their pack (ie. human owners). He's certainly not a wild animal from your description, just high energy. A truly feral (or even semi-feral) cat is a wild animal that can't be handled. Your cat's just high energy and could probably stand to have more toys and places to climb in the house. Most locations have leash laws that apply to all domestic animals, in most areas they are only enforced on dogs. In an area with a bird sanctuary, it may very well be applied to cats as well. The risks of moving you cat near a bird sanctuary, may not be just to the local birds. Check the local laws and their enforcement, fines and loss of your cat are possible. Get a collar with a bell. I'm going to say that the best and easiest way to solve this problem is to get a collar and put a small bell on it. The bell will provide enough warning that the vast majority of birds will have enough warning to escape. Yes, you say that you have difficulty keeping a collar on your cat. I admit I don't quite understand this -- it's not like cats can remove their own collars. Maybe you aren't putting the collar on tight enough? Don't strangle your cat, but make it tight enough that it doesn't slip over the head easily or at all. I like using a breakaway collar that the cat can get out of in an emergency but put it on tightly enough that an emergency is unlikely to arise. If the issue is that your cat doesn't like the collar and claws at it or whatever, that's a temporary thing. After a few weeks, your cat will probably be fine with it. If the issue is that you're using a breakaway collar and the collar keeps breaking away, just accept that you'll need to buy a replacement collar every few months or so. You mention that a collar only lasts a few days but I suspect that was either a statistical aberration, the collar was improperly attached, or the breakaway device unlatched too easily. Maybe try a different brand. A bell and collar is effective and not that big of an expense -- certainly small compared to building a massive fence around your yard or moving elsewhere or other options apparently under consideration. I would encourage you to keep trying things, even if they don't seem to work or have not worked in the past. As others have suggested, try various things to make indoors more appealing, so he has less of an urge to venture outdoors. Play with him. A lot. No, even more than that. Give him an outlet for all that energy. If he's really food motivated, it should be possible to train him to accept a collar eventually - just keep at it! And once you do, the right collar can really help out Team Bird. That article cites a small study where a brightly colored collar appeared to reduce Team Cat's kill count by 54%, and the current website for a company that sells such collars cites a study that claims 87%. Even an 87% reduction is still only a reduction, and not an elimination, however. The only surefire method to completely prevent bird killings by your cat appears to be keeping him indoors. Cats are natural predators who should have lot of physical exercise. Locking a cat into an apartment/house in my opinion is animal abuse, especially if the cat was/is used to be a free roaming cat most of it's life. Cats aren't the smartest beings but imagine being locked into the same few sq. meters for the rest of your life. That's torture. I would try different types of collars, especially ones with flashy colors. But be sure that he does not choke himself while trying to get rid of it. Try feeding him more because the amount a cat hunts and/or how far away from it's sleeping spot a cat walks is directly correlated to how much food they have. Nevertheless cats do hunt for fun so that will reduce but not stop cats from killing birds. I would just see how many birds your cat brings and if he brings so many that you think it is a endangering a whole ecosystem then I would take action. A single cat is unlikely to kill a sufficient amount of birds that the purpose of a bird sanctuary isn't fulfilled anymore. Additionally I do want to add, nevertheless I think cats should roam freely, that you do check whether it is even legal for you to have your cat outside if it's a proper nature-sanctuary because dogs are usually not allowed to walk freely in those areas. Not the answer you're looking for? Browse other questions tagged cats aggression birds domestication or ask your own question. How to let an indoor cat have some outdoors time safely? How can I make my cat less lethal? Why does touching my cat's hindquarters make him bite his paws? Need some help with a bird injury. Urgent! How do birds keep their heads in a fixed position, just like a Gyro/Gimbal? Cat who is normally docile freaks out when a neighborhood cat comes onto our porch, despite getting along well with our other cats. Why? How to treat injured female pigeon?